Operated by the State Division of Fisheries and Game, the Frances A. Crane Wildlife Management Area in Hatchville was purchased by the state in 1958 with funds provided by hunting and fishing licenses and sporting goods taxes. The major reason for acquiring more than 1,800 acres from the family of Charles Crane was to promote wildlife management and hunting access. The state took on the ambitious task of developing an intricate trail system, clearing meadows and planting some 5,000 conifers, 30 acres of millet, buckwheat and rye to restore wildlife habitat. As a result, birds, fox and other wildlife returned. Buildings that were part of the extensive Coonamessett Ranch Company, owned by the Cranes, were eventually razed. The Crane Wildlife Management Area is stocked each year with quail and pheasants. The property is popular not just with hunters, but also mountain bikers, horseback riders, nature walkers and model plane enthusiasts. The reservation also contains a rare expanse of meadowland. A late-summer stroll attests to this when the meadow wildflowers bloom and attract throngs of butterflies and birds. The largest open area used to be a grass airstrip for the former Falmouth airport; it is mowed regularly to keep the grassland from reverting back to forest. 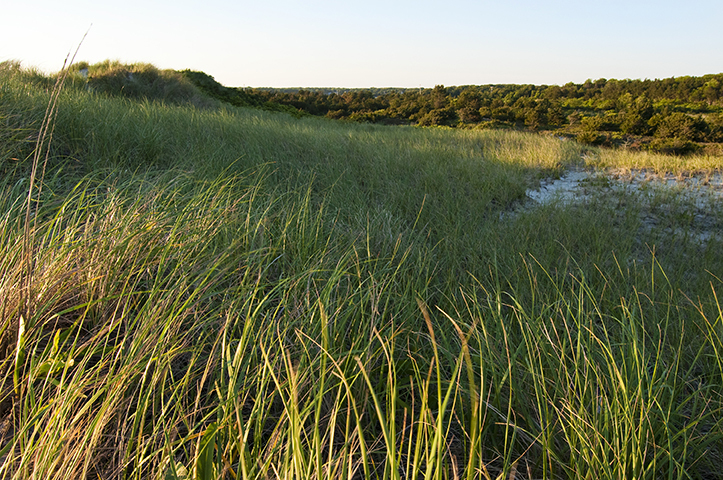 The grasslands provide habitat for a wide variety of birds and wildlife and support more than 15 threatened plant species, including sandplain blue-eyed grass, New England blazing star and sandplain flax. Small parking areas are scattered along the north side of Route 151, from the Route 28 access east to the former Nickelodeon Theater (Now Hamilton Tree). There is also ample parking on the road that lies between the parking lot of the old theater and the Joe Allietta softball field. Access to the quail-stocked woods is off Hayway Road is near the entrance to Far Out Farm. The conservation area is named for Charles Crane’s daughter, who was killed in an automobile accident in 1954 after attending an opening at Falmouth Playhouse. It was her sons who sold the land to the state and asked that it be named for their mother, Frances Crane.